Dirty science dominates our whole educational system and has corrupted it. 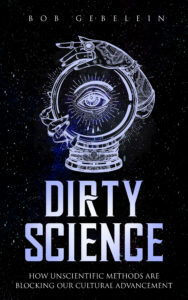 This book, DIRTY SCIENCE, exposes this corruption and abuse of power by the scientific establishment and calls on an intelligent reading public to put pressure on them to clean up their act. Scientists who know nothing about the psychic and the spiritual use unscientific methods to block the study of these subjects, and this is universally accepted at American colleges and universities. Members of the scientific establishment claim to be “objective,” but actually are heavily biased against the psychic and the spiritual and actually create an extreme bias against these areas of inquiry by their ridicule. Biologists have actually disproved Darwin’s theory of unintelligent design, but can’t admit it, because this theory is the basis for their whole quasi-religious belief system. The scientific establishment, by insisting on physical evidence, has steered psychology away from the study of the mind. We all have mental senses, with which we are able to observe our mental processes – our thoughts, feelings, memories, and dreams. The body of knowledge developed by Freud and Jung, which might have led us to a new civilization and saved our species from extinction, has been rejected because it is based on the evidence of the mental senses. Academic people who violate this quasi-religious belief system are ridiculed, shunned by their colleagues, and denied publication, funding and employment. People who have been persecuted by dirty science are invited to co-author a second book on the subject.